At the first glimpse of the case, people cannot help but notice its minimalism modern appearance. The classical combination of black and red emits an air of sophistication and delicate passion. A feeling of freshness is shining through the side panel blazing LED lights. Nevertheless, this new model is more than just good looks. With the key features of LUXO X10–right side installation, adjusting the place of 5.25” device makes more room for long VGA cards, which enhances visual enjoyment for those enthusiastic gamers out there. The right side installation design also shortens the distance between PSU and motherboard/CPU pin. 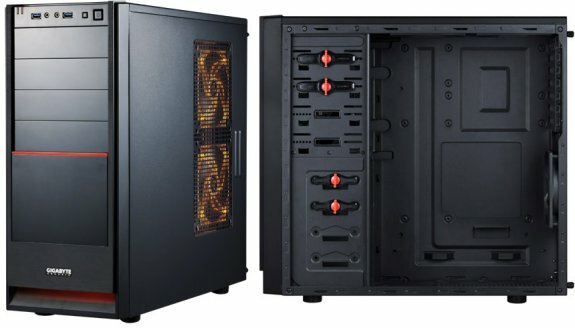 Every PSU, from high-end to budget ones, can support bottom side PSU installation. No more cable restriction. Apart from the key features, a set of other practical features makes it the best choice for astute consumers. The I/O port is situated at the top for an easier access, and two USB 3.0 ports offer remarkable transmission speed. LUXO X10 also comes with four cooling fans and can support up to six to ensure superior ventilation and prolongs the lifespan of all the gadgets inside. Clip-lock and lever mechanisms; cable-managed interior with cables all clamped and managed allowing the internal routing looks neat and maximizes the airflow. Last but not least, it offers a thoughtful design at the bottom–removable power dust filter so that your case won’t be clogged by those crazy dust bunnies.